The Rocky Horror Picture Show is the quintessential cult classic, which still brings costumed fans together every time there's a public screening. While they aren't as frequent as they used to be here, tonight at 10:45 p.m. there's one at Lincoln Center's Damrosch Park. But dammit, Janet, there's a catch: it's silent. "In what may be a first for the international cult classic, its Lincoln Center screening will be silent—the audience will hear the sound via wireless headphones. Costumes and audience-talk back, however, are still strongly encouraged! 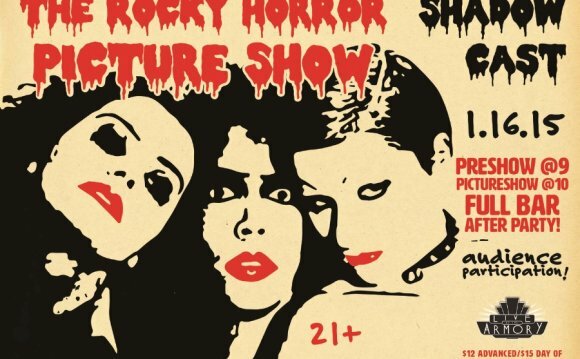 NYC RHPS, New York City’s Official Rocky Horror Picture Show™ Cast, will be on hand for a live shadowcast performance." The 1975 musical comedy horror film brought together a young Susan Sarandon, Meat Loaf, Tim Curry, Barry Bostwick, and many more. It was critically panned upon its release, which is the origin story of any great cult classic, but it soon became a popular midnight movie, with audience participants, at the Waverly Theater in 1976. One fan recalls how it all began: "The manager of the Waverly, Denise Borden, was fascinated with the film and she began her own personal hype campaign, with photos in the box office window and a theater telephone recording that stated, 'This is a film not to be missed.'"